FAA DESIGNATES BUNDY RANCH A 'NO-FLY' ZONE! FAA DESIGNATES BUNDY RANCH A ‘NO-FLY’ ZONE! 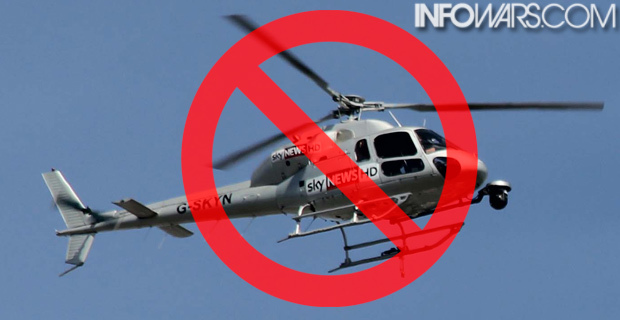 Yesterday afternoon the Federal Aviation Administration designated the airspace above Bundy Ranch near Bunkerville, Nevada a “no-fly zone” with altitude restrictions that effectively ban news helicopters. The “temporary flight restrictions,” revealed by a contributor to the Free Republic, bans all air traffic under an altitude of 3,000 feet in the vicinity of the ranch except for aircraft operating under the direction of the Bureau of Land Management. A map of the no-fly zone is available here. Undoubtedly these flight restrictions are in response to the intense media presence now surrounding Bundy Ranch. “Keeps the media choppers away so the BLM can do what it wants,” a contributor named SkyDancer pointed out on the Free Republic. It’s quite obvious that this is the case considering that news helicopters routinely fly at an altitude under 3,000 feet in order to capture the best footage. Recently, cowboys who are supportive of Cliven Bundy have been successful at rounding up Bundy’s cattle before the BLM could impound them, so it certainly appears that the agency is using the flight restrictions as a cover to target these cowboys without any fear of potential brutality being leaked to the media. BLM agents have already assaulted several protestors, including a pregnant woman and a cancer victim, which was fortunately caught on tape. The feds are attempting to regain control of the narrative surrounding the standoff, especially since it is now known that U.S. Senate Majority Leader Harry Reid (D-Nev.) is behind the land grab for the future development of solar farms with Chinese energy companies. It is also concerning that by interpreting the no-fly zone to the letter, the BLM could even delay medical helicopters from flying into the area to evacuate individuals who are severely injured. Although air ambulances are typically exempt from temporary flight restrictions, pilots are still supposed to gain clearance before taking off, which in the past has kept medical pilots grounded until permission was granted.